YouTube member Morishowta is quite possibly a genius. His wrist-mounted iPhone holder is one of the coolest DIY projects ever, with echoes of the concealed blade in Assassin’s Creed. 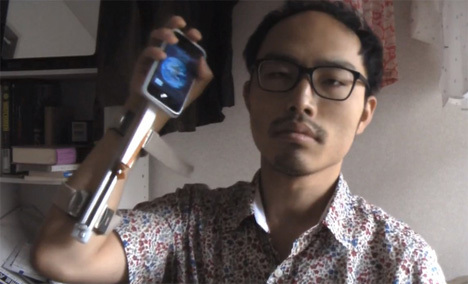 The holder lets Morishowta extend his arm to have his phone slide from his sleeve right into his hand. It’s a brilliant idea for someone who needs quick access to their iPhone without digging around in a pocket…plus it looks crazy-cool. The project itself is awesome enough, but what makes it really newsworthy is Morishowta’s hilarious videos. The video above shows the inventor’s trial and error process including a lot of deadpan slapstick humor as he draws his phone over and over. Another video from this insanely funny guy shows his attempts to build a similar holster for his iPad and a cell phone-covered shirt. Then a lot of bizarre but hilarious things happen – we really have no idea what’s going on, but we know funny when we see it. See more in Do It Yourself or under Technology. February, 2013.